Welcome Sharon Ledwith. Thank you for visiting this blog. We're thrilled to have you here. I'm thrilled to be here, Robyn. 1. How long have you been writing, Sharon? 2. Where did you get your idea and inspiration to write The Last Timekeepers and the Arch of Atlantis? Both the idea and inspiration came to me through a dream I had around 1998. In this dream, I saw seven arches, and there were seven people (five kids, two adults) with crystals in their hands, walking up to these arches. It definitely had an “Indiana Jones” feel to it. At that time, I was writing a paranormal romance (before there was a distinct genre) and had no intention of writing a middle-grade/young adult book like The Last Timekeepers. But this idea kept growing in my mind, and wouldn’t leave, like some mystical force pushing you from behind. So, I thought I’d challenge myself and write a novel—a series—that would appeal to my son, who at the time was the target age of my audience. I’ve always loved the time travel genre, so I imagined the arches I saw vividly in my dream as time portals. It was a no-brainer for me. 3. 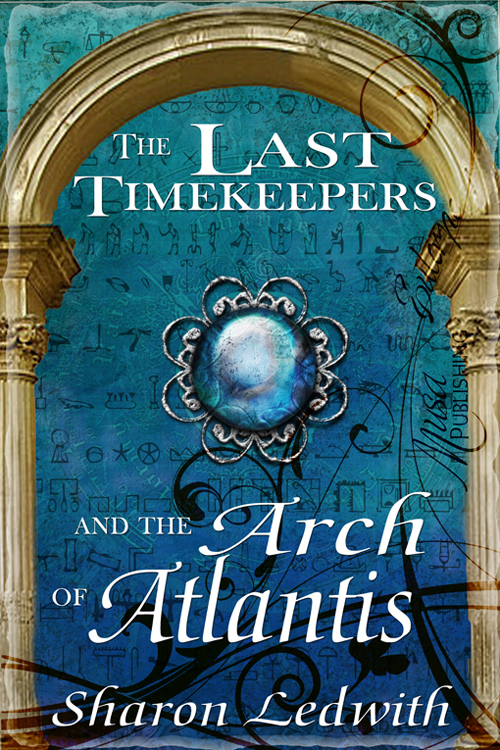 What sets The Last Timekeepers and the Arch of Atlantis apart from other books in the same genre? Keyword: Atlantis. I wanted to create a book series for middle grade/young adults that had a different slant to the time travel genre. I love history. I also love myths and legends. There’s many time travel series out there, but nothing that has roots leading back to Atlantis—at least what I know about and have read. And since there’s no concrete evidence that Atlantis did exist, then that left the door (or arch) wide open to possibilities. 4. As an author, Sharon, what is your writing process? Cut a vein and write. Kidding. I have many notebooks and pads at my disposal. I also have a file full of ideas. I guess I start with the characters and build the story around them. My characters must carry the story to completion, give my readers closure. It’s a must. In order to do this, I begin writing out character tracking sheets (stats on characters' appearances, clothing, likes and dislikes, etc.) which have served me well throughout the writing process. Then the fun begins. Research, research, and still more research. When you’re writing time travel, you’ve got to know your facts to create the fiction. I love this part of the journey too. Only when I have enough facts, and I feel my characters are fleshed out sufficiently, then I begin to start the novel. Sometimes I’m a pantser (writing by the seat of my pants), sometimes a plotter (outline entire storyline)—it all depends on the tone of the book and where my imagination directs me. 5. How long did it take for you to start and finish The Last Timekeepers and the Arch of Atlantis? Groan. I started gathering ideas and writing the first draft in 1999. 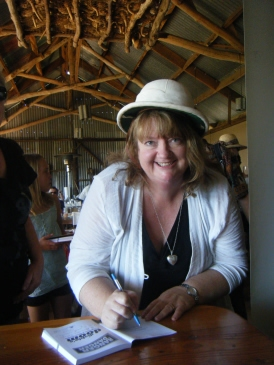 I signed the publishing contract with Musa Publishing in September, 2011. Now, this was a back and forth project. During the last eleven years, I wrote a second book in The Last Timekeeper series, created and penned another young adult series (a teen psychic mystery series), worked on my paranormal romance, took a writing correspondence course, and worked at the local animal shelter. I finally picked The Last Timekeeper series back up in 2010, transcribed and polished it, and kept sending it out until I struck gold with a publishing contract offer. And even then, after all that, there were major revisions on changing my point of view over from five characters to one character. But I was determined, and did it. 6. Do you have any advice for other writers, Sharon? 7. 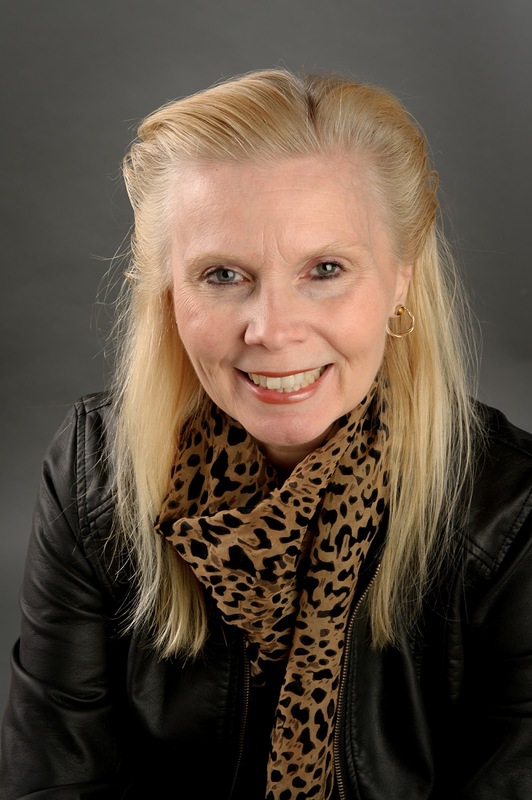 What’s next for Sharon Ledwith, the author? 8. 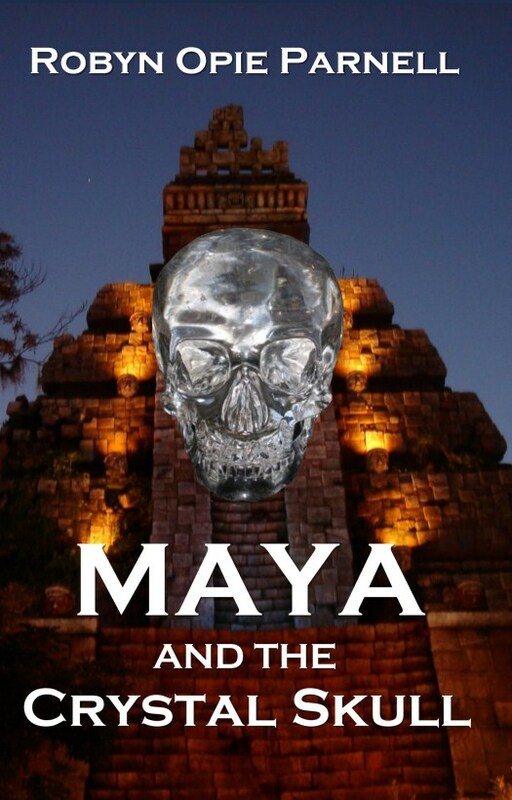 My novel, Maya and the Crystal Skull, features ancient Mayan ruins and the legend of the crystal skulls. 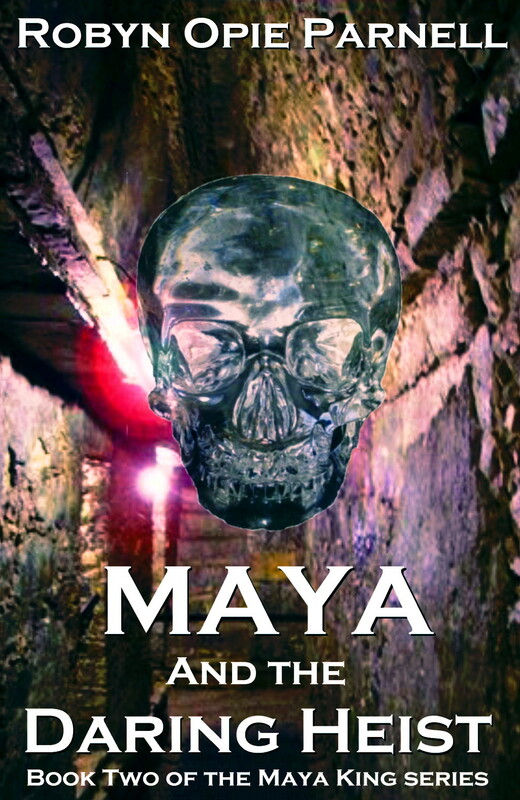 The crystal skulls, in particular, allow heroine Maya King to momentarily glimpse the past. As the author of The Last Timekeepers and the Arch of Atlantis, do you believe in past lives and our ability to momentarily glimpse those lives? Oh, yeah! In fact, I believe we’ve known each other in a past life too, Robyn! Think about it. We were probably scribes who chiseled out glyphs or created wonderful hieroglyphics on the walls of pyramids. Do I think it’s possible for us to receive a glimpse of a past life? Most definitely. But you have to be open-minded about it. Especially if you have a memory flash of another person in another time period, don’t dismiss it. Even your feelings about another place or person are wonderful guides. Just remember to trust your inner voice – that’s where answers are found. Thank you for an interesting interview, Sharon, and all the best with your books. Black Baron is a cockroach but not just any cockroach; he’s a racing champion owned by Jake. After a near miss with his cleaning mad mum [Black Baron is kept in an old shoebox under Jake's bed], Jake promises to clean his room himself. 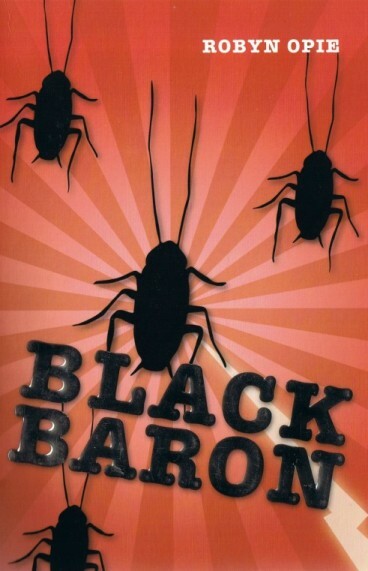 Unfortunately, the world is full of good intentions, and a lapse by Jake means that Black Baron is discovered, and his dad phones the pest exterminator. As Jake and Black Baron’s hilarious adventures unfold, at every page turn you find yourself asking; Is Black Baron doomed? Will he possibly escape his seemingly inevitable fate? As a mother of a son I am sure that this highly entertaining story will hold great appeal especially to boys [or tomboys]. Congratulations to Alison Reynolds (writer - pictured left) and Heath McKenzie (illustrator) on the release of their picture book A Year With Marmalade published by The Five Mile Press. Today Alison is visiting my blog as part of her A Year With Marmalade blog tour. Hi, Alison, thank you for being here. It's great to have you as my guest. Thank you so much for inviting me to your blog, Robyn. It’s a very comfy, happy place to be! It’s about losing old friends and making new ones. When Maddy’s family relocate for a year, she must leave behind her cat, Marmalade, and her best friend Ella. The story of the growing friendship between Marmalade and Ella is set against a backdrop of the changing seasons. And now over to my interview with Alison. 1. Can you describe the process you go through to write a picture book? The last few picture books have been commissioned so I’ve been given a very vague theme to explore. 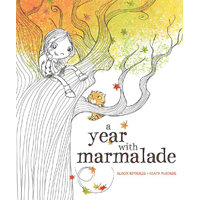 In A Year With Marmalade, the publisher wanted a book to reflect the seasons. My actual process begins with a visit to the newsagent to buy a couple of pens that feel right and a blank visual diary. It has to be blank and then I can scribble down random thoughts and lines. I find that ruled paper makes me feel as if I can’t fiddle around and play. I always make sure that the illustrations have a lot of room to further the story. I even do terrible sketches that no one will ever see, just to make sure there is something different to illustrate on each page. Picture books are the only genre that I tend to write the first drafts in long hand. 2. How long does it take you to write a picture book? How long is the deadline? I am relatively quick, but during the writing process I tend to live very much with the story so I’m writing all the time in my head. A Year With Marmalade took about four days, but that is very much an exception. And they were very hectic days. I was constantly running down the hall to peck away at the screen once I had the first draft. 3. On average, how many drafts would you do of a picture book? Too many. Seriously, I draft and draft and draft. I have no expectation of having the story flow out first time. I really enjoy seeing a kernel of possibility and working on that. My final draft often looks like a totally different story than my first draft. A Year With Marmalade did resemble its first draft very closely, which is very unusual for me. I had written a totally different story that I had drafted countless times and even sent off to the publisher. Then A Year With Marmalade floated into my mind. So I then sent that off and said, “Can you forget the first story?” Luckily she did. I feel as if the first version was actually part of the drafting process for me to find the final A Year with Marmalade. 4. Do you ask other people for feedback on your picture books while you're writing them? If so, why? I probably only show complete drafts of picture books. I’m conscious that it would be a waste of time for the people giving me feedback if I said, “Oh, yes I’m going to change that anyway.” I might send off a sentence in isolation if it’s really irritating me, but I usually only send the complete picture book. I’m extremely fortunate to have Dee White as my crit partner and she tells me like it is, which is a fabulous quality. I’ve got another friend, Maureen Edwards, who has a great eye for picture books . I sent A Year with Marmalade to her just before I sent it to the publisher. You are an extremely lucky writer if you have people you can trust not only to criticize your work, but also want your work to be as good as it can be. 5. What else would you like to tell us about Alison Reynolds or her books? That’s a bit hard, Robyn! I don’t eat horse radish and ABBA gives me a tummy ache. I like writing in many different genres. For a while I was writing choose-your-own-adventure style books, which I loved. Then I wrote a compilation book for adults, called For you, Mum. Then I had a spate of board books. Recently, I seem to be concentrating on picture books. And I have a YA book, and adult novel itching me. I love A Year with Marmalade, especially Heath McKenzie’s illustrations. Thank you for hosting me, Robyn. And best of luck with all your current and future books! Thank you for visiting my blog, Alison, and for being a great spot by answering my questions. All the best with the rest of your blog tour, A Year with Marmalade, and all of your books. I wish you every success! Please read on for more about Alison Reynolds, Heath McKenzie and A Year with Marmalade. 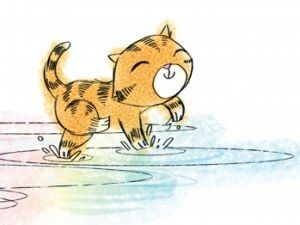 Marmalade’s personality really shines through in Alison Reynolds and Heath McKenzie's newest picture book A Year with Marmalade. Share your favorite picture showing your cat's personality to win. Alison can’t wait to see your purrfect photos! Entries close on the 1st of September 2012. Congratulations to Alison Reynolds (writer) and Heath McKenzie (illustrator) on the release of their picture book A Year With Marmalade published by The Five Mile Press. Thank you to everyone who responded to my request for help in choosing a cover for my next novel Maya and the Daring Heist. (Please see previous post.) The response was overwhelming. Thank you so much for generously offering your time and feedback. I tried to answer the personal emails I received, though I still have a few remaining. I apologize to the wonderful people who left comments on my blog. I fully intended to respond to each and every one of you, but the comments grew and grew and grew. Even if I didn't get a chance to individually thank you, my appreciation goes out to you now as it did when you left your comment. Thank you so much. In the end I received feedback from 96 individuals. I wasn't expecting such a great response, but I definitely appreciate your warmth and wisdom. Cover 1 received 33 votes or 34% of the votes. Cover 2 received 26 votes or 27% of the votes. Cover 3 received 16 votes or 17% of the votes. Cover 5 received 6 votes or 6% of the votes. The award for most popular cover goes to Cover 1. Congratulations Cover 1. 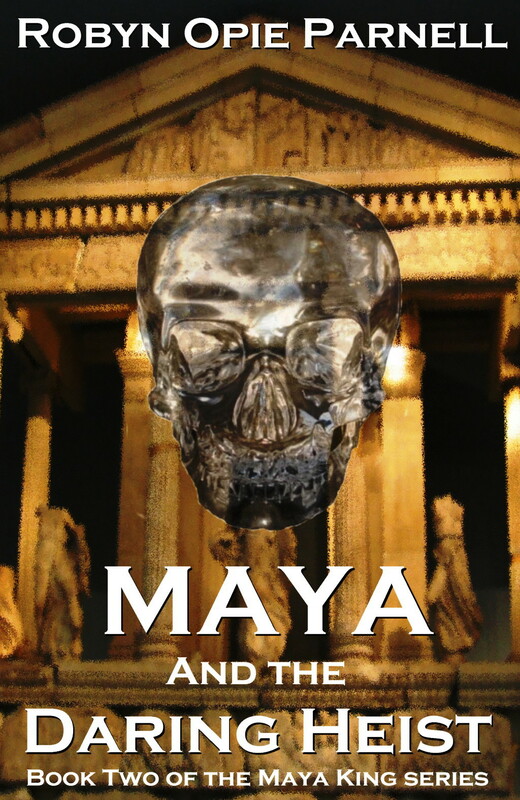 And, most importantly, the winner of a copy of the first book in the series Maya and the Crystal Skull... Due to the overwhelming response, I decided to give away 2 copies of Maya and the Crystal Skull - one paperback and one e-book. So you have two chances to win! 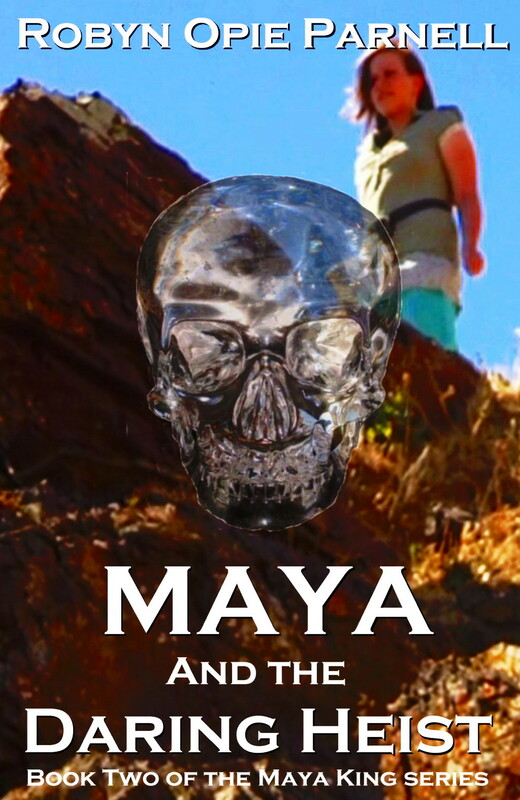 The winner is... of the paperback copy of Maya and the Crystal Skull... Michele Darmanin! 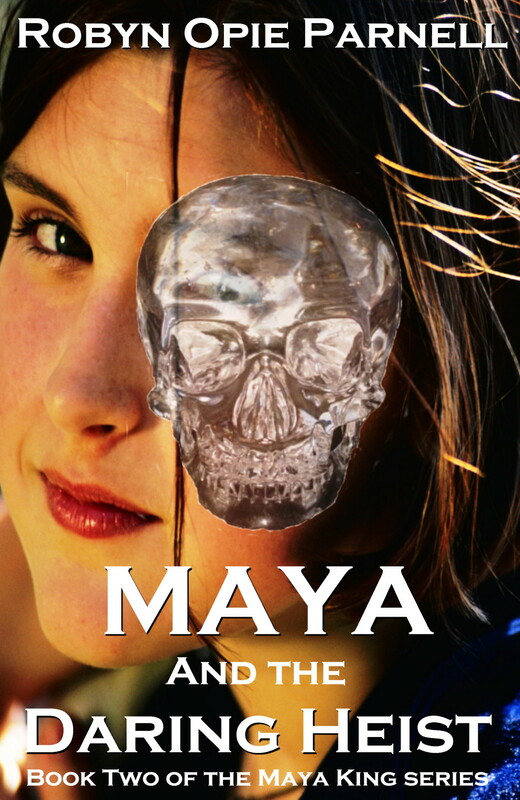 The winner is... of the e-book copy of Maya and the Crystal Skull... Liz May! I still haven't decided which cover to use. I'm stuck between Cover 1 and Cover 2. The votes for these two covers were very close. Well, I'll keep you posted and let you know what I decide. 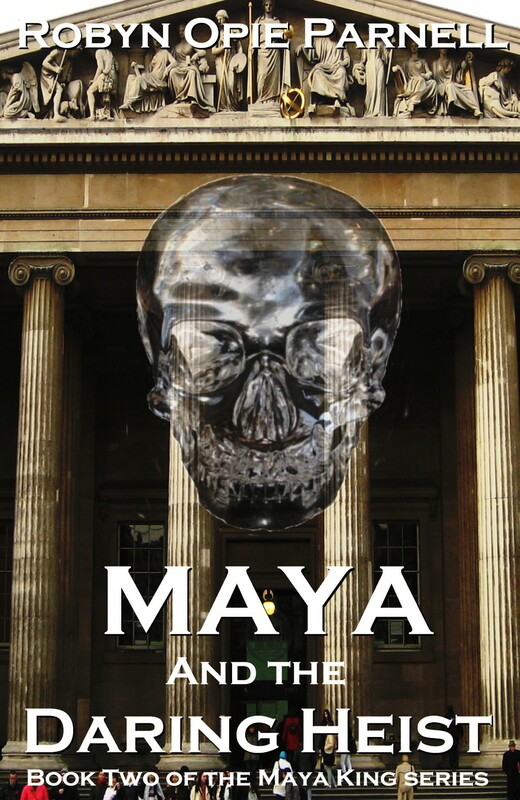 Thanks again to everyone who assisted me by offering feedback on the potential covers for my novel Maya and the Daring Heist. I appreciate and value your help. Have a positively wonderful week.